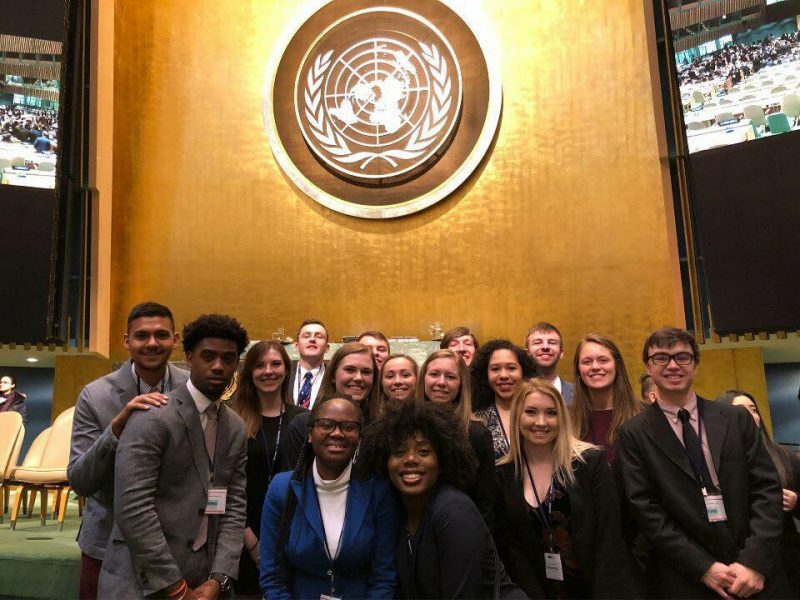 The University of Lynchburg Model United Nations team won a bevy of awards at the annual UN simulation conference in New York last week. The Lynchburg team of 16 students represented Luxembourg, while thousands of students from other universities represented other countries. But the Lynchburg-Luxembourg delegation stood out. Two delegates, Imani Anusiem ’18 and Ladell Bush ’20, won Outstanding Delegate awards. The group won five Outstanding Position Paper awards and picked up an Honorable Mention Delegation award. The students spent the first part of the semester researching global issues, determining Luxembourg’s position on those issues, and thinking strategically about how to promote the country’s interests and negotiate with students representing other countries. As Lynchburg’s head delegates, Maggie Kaliszak ’20 and Tess DeGraffenried ’18 led the team in the preparations and gave advice throughout the conference. Thousands of students from universities around the world participated in the conference March 18-22. The conference helped Allman realize how much she has learned this semester. “I have a better grasp of and respect for the UN and collaborative foreign affairs, as well as a new understanding of the way people communicate to reach a common goal,” she said. Throughout the conference, Lynchburg students gave speeches, talked one-on-one with delegates from other schools, and voted on policies. “Not only were our students prepared, but they were engaged, driven, and hard-working,” DeGraffenried said. A couple of team members were pleased by how well they compared to students from other schools. “We were among some of the most prepared delegations in the Model UN simulation because we had the support of Dr. Manian and our two head delegates, who not only helped us prepare our position papers but also helped us prepare our speeches and encouraged us to revise and practice until we were confident and comfortable with them,” said Elise Togbe ’18. Throughout the conference, students filmed each others’ speeches and posted them on Facebook to celebrate their performance. The awards they reaped were a great bonus. “The level of pride I felt for my team’s hard work and excellence shown in New York will go unmatched for quite some time,” Sarah Mock ’20 said. University of Lynchburg has participated in Model UN for more than 40 years. Like in previous years, the students gave the experience high marks after the conference. 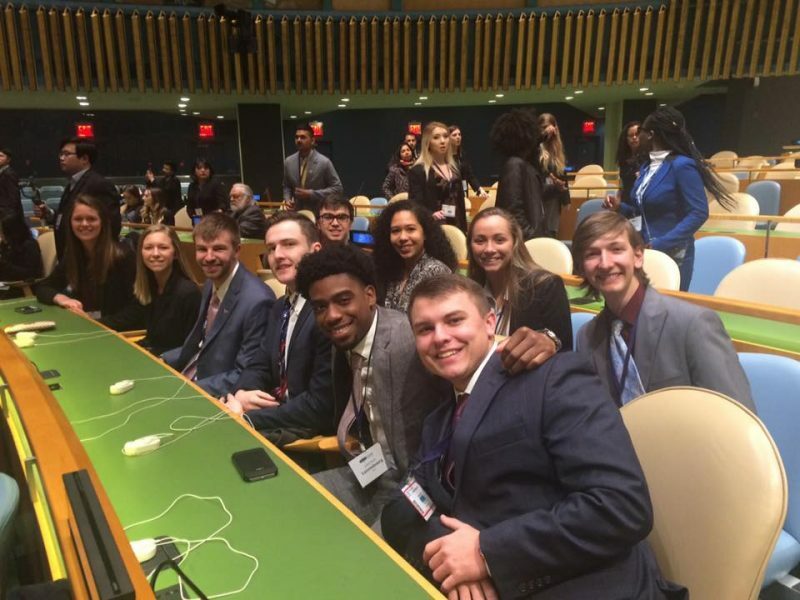 “I have enjoyed every single second being part of this esteemed delegation,” said Logan Hancock ’18, who was participating in Model UN for his second time.